Like every other system, there are legitimate challenges that if not addressed would slow down adoption. Topping the list is scalability and steps taken by the team to address this obstacle. Scalability appears to be a burden across all the major proof of work systems and with Ethereum leading the way as a go-to platform for launching dApps and other smart contract powered products, influx of users—even though being the ultimate objective—often times bog down performance. 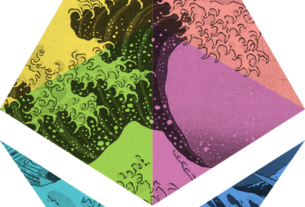 In times of climactic demand, throughput shrinks to the region of 5TPS from around 15TPS. However, this is not to mean that the network isn’t scalable and the snail-paced progress—hampered by never ending deliberations as a public chain–towards solution formulation would ultimately lead to user hemorrhage while simultaneously allowing alternatives as EOS or Tron for example to take over from Ethereum. As far as we know, Ethereum is through is about to bottom out from the Trough of Disillusionment after massively benefiting from the meteoritic rise fueled by the ICO mania of late 2017 and early 2018. Then it was all about hype and after peaking, the painful dip lead to a reset to factory settings. It was a momentum of reckoning and now ETH as a digital asset is being valued fairly. Even so, the overall objective is to translate Ethereum into this world supercomputer and progress towards this mission statement is being fast-tracked via main-chain and off-chain proposals. Clearly, ETH bulls are having a hard time against a wave of sell pressure. Even though progress has been made and the coin is up 2.1 percent from last week’s close and pretty stable in the last few hours, bulls have a lot to prove. 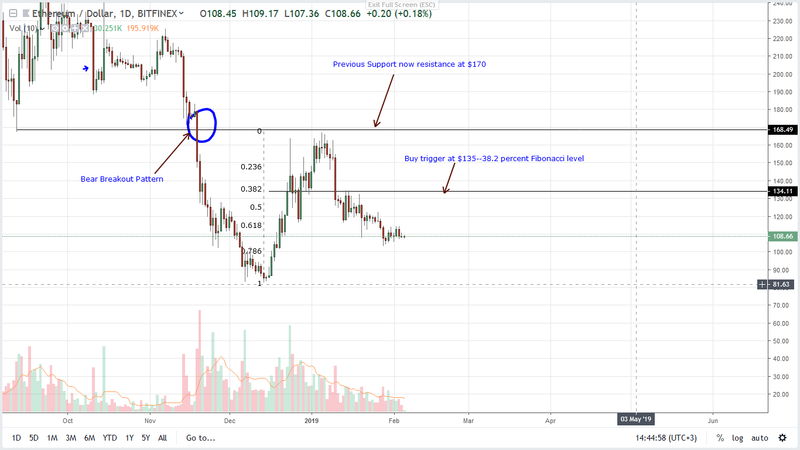 From previous ETH/USD price analysis, it will be imperative for bulls to build enough momentum and drive prices above $135. That will trigger the first wave of bulls aiming at $170. This mark as we know is the previous support now resistance mark. A comprehensive close above this tag invalidate the bear breakout pattern price action is trending in. From a top down approach, sellers have an advantage over bulls. It’s easy to see why. As aforementioned, conservative traders should fix their eyes on how prices react not only at $135 but at $170. The level is previous support now resistance and because it defines current price action, the only time buyers would be in charge and trend shifted from bearish to bullish is when there is a conclusive break above this mark. That will largely depend on the strength of this short-term bull trend set in motion after mid-Dec 2018 up-swings. After a deep correction from Dec 2018 highs, we first need to see confirmation of Jan 28-30 three-bar bull reversal pattern with prices racing above $120 and later $135. Thereafter, and with prices finding support from 78.6 percent Fibonacci retracement levels, odds are ETH will retest $170 in the medium term. For now, we suggest a wait-and-see approach. Aside from Jan 10 bear bar, Jan 30 bull bar is hinting and guides our trade plan. Since we are net bullish because of mid-Dec, early Jan upswings, we need to see confirmation of Jan 30 bull bar—319k versus 220k. If indeed buyers are in charge then any surge that will see ETH trend above $120 and $135 should be propelled by above average volumes exceeding 319k or 635k of Jan 10. Otherwise, similar volumes that leads to a meltdown below $100 would confirm Jan 10 and 20 bear bars signaling bear trend continuation.